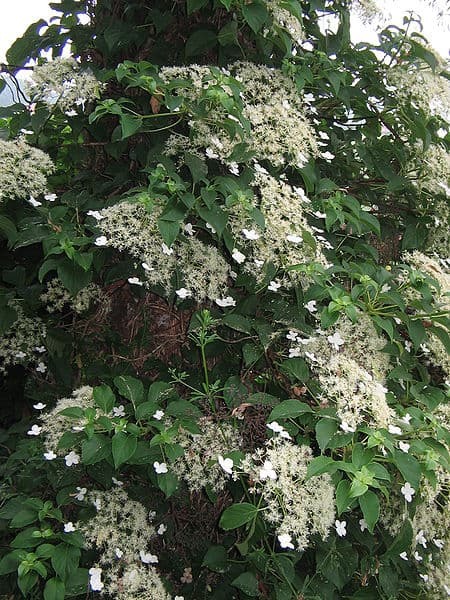 Hydrangea petiolaris (Climbing Hydrangea) is a hardy climbing deciduous plant that uses its adventitious roots to grip to walls and fences and flowers from around June onward producing enormous white lacecap style flowers that can be almost 30cm (1ft long). Slow to start growing they sometimes take a couple of years for them to establish before they really start to put on growth and show their full potential but it’s well worth the wait. Pruning is not necessary and should be avoided if possible but should you choose to prune them then be warned it may affect the flower for a year or two as they do flower on last years growth. Climbing Hydrangeas need to be pruned straight after they have flowered as they produce new flower buds soon after flowering and hold on to them until the following spring when they flower again which is why if you prune it too late you will be cutting off the new flower buds. Simply prune just below the spent flowers after they finish flowering, it will then put on new growth that summer which will, in turn, produce the flower buds for the following year. Climbing hydrangea are well known for growing well in shady areas where other climbers would fail. They will grow well in shade, partial shade and full sun. In partial shade they tend to no flower as well, semi-shaded spots seem to b just right for them. They will grow in moist but well-drained soil (avoid areas which become waterlogged). For the first couple of years keep well watered and do not allow to dry out, prune spent flowers straight after flowering and mulch up with the organic matter later in the season to add a little protection during winter.